Wyndham just unveiled their summer 2012 promotion for quadruple miles or points between July 17th and September 13th, 2012. You can earn quadruple points or miles starting from your second stay after registering for this promotion. Note that you can earn quadruple points or miles for up to four stays. There are quite a few airline partners with Wyndham Rewards and the earning per partner varies by brand. The Wyndham branded hotels earn 500 base miles on most of the programs i.e. your second stay credited to American Airlines AAdvantage would earn total of 2000 miles. That is not bad at all. If you collect Wyndham Rewards points, you would earn 40 points per dollar spent at all other brands besides Hawthorn, where the quadruple points would be 20. You can read more about the airline partners and number of miles that you earn here. Remember to check that the country is participating list for the Wyndham Rewards. I recently stayed at a Ramada hotel in Sri Lanka and got no points. To qualify for the “Book Direct Quadruple Points or Miles” promotion and earn quadruple Wyndham Rewards® points, airline miles or rail points, the member must (i) register at wyndhamrewards.com/sweet or 1-866-996-7937, (ii) book a stay on wyndhamrewards.com, daysinn.com, ramada.com, wyndham.com, wingatehotels.com, hawthorn.com, super8.com, baymontinns.com, microtelinn.com, hojo.com, travelodge.com, knightsinn.com, dreamintl.com, nighthotelny.com, tryphotels.com or wyndhamhotelgroup.com, at a qualifying rate between July 17, 2012 and September 13, 2012 and complete their hotel stays by September 20, 2012 (“Promotion Period”), and (iii) provide a valid email address. Members will receive quadruple Wyndham Rewards points, airline miles or rail points starting with their second stay within the Promotion Period for up to four (4) separate qualified stays (for the second, third, fourth, and fifth qualified stays) with a maximum of 3 rooms per stay. Points, airline miles or rail points will be awarded based on earning preference selected in entrant’s member profile at time of second, third, fourth and fifth qualified stays. Member stays with check-out dates after September 20, 2012 will not be counted towards the promotion. Rates offered by most on-line travel agencies and certain other rates do not qualify. One stay includes all consecutive nights at the same hotel regardless of check-ins or check-outs. Members should allow six to eight weeks after completion of registration and stay(s) for the bonus points, airline miles or rail points to be credited to their account. There seems to be yet another Bourne movie coming out soon. American Airlines is offering a Bourne “theamed” promotion for up to 30000 bonus miles after five returns. This promotion is valid for tickets issued on July 18th or later and for travel from September 4th to November 15th, 2012. You need to register for this promotion prior to your travel for the bonus miles to kick in. Thing to note here is that this promotion is NOT valid on the lowest coach fares in N, Q, and O buckets. It is nice promotion nevertheless, if you are going to ticket fares that book into higher fare classes and can pocket the bonus miles in the process. To qualify, members must fly on eligible purchased, published-fares (excludes fares booked in N, O and Q) on flights marketed and operated by American Airlines, American Eagle or the AmericanConnection carrier between September 4, 2012 and November 15, 2012. Registration prior to travel and before midnight, CDT, September 15, 2012 is required. Registration for the American Airlines AAdvantage Welcome To The Program Sweepstakes at AA.com/BourneLegacy before August 31, 2012 is also required to qualify for this offer. Travel must be booked between July 12, 2012 and September 15, 2012. The bonus is not retroactive to reservations booked prior to July 12, 2012. A round trip is defined as two one-way trips booked in a single reservation under one ticket number. A maximum of one round trip is permitted per reservation. Bonus miles do not count toward elite status qualification. Members will earn 1,000 bonus miles after one (1) round-trip; 3,000 bonus miles after two (2) round-trips for a total of 4,000 bonus miles; 6,000 bonus miles after three (3) round-trips for a total of 10,000 bonus miles; 9,000 bonus miles after four (4) round-trips for a total of 19,000 bonus miles; and 11,000 bonus miles after five (5) round-trips for a total of 30,000 bonus miles. A maximum of 30,000 bonus miles may be earned from this promotion in conjunction with flying five (5) eligible round-trips. Bonus miles will be posted 4-6 weeks after round-trip travel is complete. This offer is only valid to AAdvantage members in the US and Puerto Rico. This is a monthly update of Priority Club one time promotions that are valid. These are all combinable with other promotions as long as they are not conflicting. If the code doesn’t work for you, you have signed up for the same or variant of the same promotion previously. These eight promotions and the surveys should work for all. The Elite member next stay bonus probably requires a Gold or higher status with Priority Club, however. The weekend 5K bonus points may require an address in the United States. Remember to sign up for the other on going Priority Club bonus points offers that you can find here. You can get 500 Priority Club points for just signing up for the shopping email. This should be open for all. You will get 5000 Priority Club bonus points for a two night weekend stay. Weekend is typically defined Friday/Saturday/Sunday nights. The stay must occur before the end of 2012. This promotion may require your Priority Club access to be in the United States. The promotion did post for me after a while. Not sure exactly how this works, but here’s the info about this offer: We’re pleased you have continued to stay with us and are now even closer to earning exclusive Platinum Elite benefits and 5,000 bonus points. All you need to do is register and stay with us 5 more nights before 30th November 2012. It would be our pleasure to reward your loyalty with exclusive Platinum Elite benefits. Keep staying with us and you’ll soon be there. We look forward to helping you make it to the top: Platinum Elite status! If you have feedback on any of these promotions or if I have missed any current promotion that should be included on the list, you can leave a comment below or send me an email to john@loyaltylobby.com. AviancaTaca’s Lifemiles is now offering a transfer bonus for miles transferred between LifeMiles members. You have to pay a fee of $15 for every 1000 LifeMiles transferred. Essentially, you are buying miles at 1.5 cents each. This is very interesting because the airline joined the Star Alliance last month and just released an award chart for Star Alliance carriers. This offer is valid for transfer made from July 16th to July 31st, 2012. The minimum number of miles that you need to transfer is 1000 and the maximum 50000. From July 16th to July 31st, for every 1,000 miles you transfer to the account of a relative or friend, we will double the miles transferred to your friend’s account. Pay USD $15 plus local taxes per each block of 1,000 miles. Transfer now and enjoy with your friends flying with Avianca, TACA, AeroGal, Star Alliance member airlines, also at hotel stays, car rentals, tickets to amusement parks and many other options we offer your through our air and commercial partners’ network. This promotion is available through LifeMiles.com, Avianca and /or TACA’s Information Centers and Call Center. This is a great offer to get started on LifeMiles. You just buy few thousand miles first at the full price and then bounce them back and forth few times for $15 per 1K miles. This promotion applies between July 16th, 2012 and July 31st, 2012, as the last date of purchase. The miles transferred and earned with this promotion do not apply to achieve Elite status. This is a new monthly feature of current public Priority Club promotions. Tomorrow, I will have an updated list of one time Priority Club bonuses. The beauty of Priority Club is the onslaught of ongoing overlapping promotions that you can triple/quadruple dip. You can take your points earnings to a new level by making sure that you have sign up for all the offers. You can read about my average Priority Club point earnings when all the promotions are factored in here. Just a word of warning. Some of these promotions may require an address to be in a specific country/area like United States. I take absolutely no guarantees what will post to your Priority Club account. They may also conflict with a promotion that you have already signed up for and just return an error message. You will get 1000 bonus Priority Club bonus points per nights + 250 points per stay for booking online. This offer is valid until September 3rd, 2012. This is a nice bonus point promotion for InterContinental stays in the Americas. You need to get the stays in by the end of July, 2012. This promotion cannot be combined with the 15K Bonus + Golf after 6 stays. This offer is valid until the end of July, 2012. This is a nice bonus for a stay in Canada. You need to have the stays by December 30th, 2012 to be eligible for the bonus miles. You can get a $75 prepaid MasterCard after a rebate for a two night weekend stay. This offer is valid until September 3rd, 2012. This is similar to the weekend offer, but is valid for weekday stays. This offer is valid until August 2nd, 2012. You can now get 500 Air Canada Aeroplan miles just for singing up for Le Club Accorhotels membership and choosing Air Canada Aeroplan as your preferred loyalty program. There doesn’t seem to be a requirement even to have a paid stay. If you already have an account with Le Club Accorhotels, all you need to do is to change the loyalty program partner to Air Canada Aeroplan. There is currently similar offer with Delta Air Lines as well. This offer is valid from June 1st to August 31st, 2012. 1. Between June 1 and August 31, 2012 new and current Le Club Accorhotels members can earn 500 bonus Aeroplan Miles by choosing Aeroplan as their preferred loyalty program. 2. General Le Club Accorhotels terms and conditions apply to the “Earn 500 bonus miles with Aeroplan ” offer. 4. The bonus will be credited in Le Club Accorhotels points and converted into Aeroplan miles according to applicable conversion rule. 5. This offer may not be combined with other current offers or advantages and does not apply to groups. 6. This offer is subject to availability. AirAsia is a budget airline based in Kuala Lumpur, Malaysia. Today the group also has AirAsia X their long haul arm, Thai AirAsia, Indonesia AirAsia, Philippines’ AirAsia, and AirAsia Japan. There really isn’t a difference between these various AirAsia off springs. They can all be booked on AirAsia’s website and only the airline code is different for each of the airlines. Now, AirAsia has a sale for travel from January 4th to May 22nd, 2013. You need to book the flights from 16th of June to 22nd. You can access the destination list that is available from their various cities here. I just checked what is available from Bangkok and the list is available here. I decided to check how’s the booking process, and if the advertised fare is available. I run few searches for Bangkok to Colombo route and it took few tries before I found the advertised fare. Remember that you probably need to pay a credit card at the end of the booking process. It should be around 3 USD. Remember that AirAsia is a budget airline, although a good one. They try to sell you all kind of extras during the booking process from insurance to food. You also need to pay for checked in luggage. I have taken AirAsia couple of times and wouldn’t mind taking them on flights that are not more than couple of hours long. The pitch is tight and there isn’t any kind of entertainment besides the crew trying to sell your food & beverages. Luckily on my AIrAsia flights the loads have been rather low and I have had the entire row to myself. I have no idea of my schedule for the first half of 2013 and thus won’t be able to entertain idea participating to this sale. This helps a lot when you encounter payment error. You can always return to ‘Manage my booking‘ to complete the payment without having to go through the hassle of rebooking! Much easier right? NO discrimination to other browsers but these two browsers are reported to be the most stable throughout the booking process. Prepare a few travel plans. If Plan A doesn’t work, at least you’ll have back-up plans and you’ll save the hassle of planning from scratch again. If your passport is expiring soon / not registered yet, NO worries. Just fill in your current details and update your latest passport details via ‘Manage my booking‘ at no extra cost and at a later time convenient to you. You will only have up to 10mins at the Search and Select Flights pages each, linger any longer and you will be redirected back to the ‘Waiting Room’. DO NOT attempt to open Multi-TABs (under the same browser) to search for fares as it may ‘confuse’ you during the booking process. You may end up with the WRONG travel date. You will be directed to the ‘Waiting Room’ when your search needs a little more time. So don’t refresh your browser when you’re in there or face a whole new ‘Waiting Room’. This page tend to pop-up at the later stages of your booking IF the server is a little busy. You can easily refresh the page by pressing the “I would like to try again” button to continue. American Airlines just sent me a reminder email to participate to the Summer Miles Challenge to support their Kids in Need program. The key here is that you will receive 100 miles just for registering on Facebook and will have a chance to win lot more. American Airlines will donate 100K AAdvantage miles to their Kids in Need program if 100K smiles is reached through this “game”. 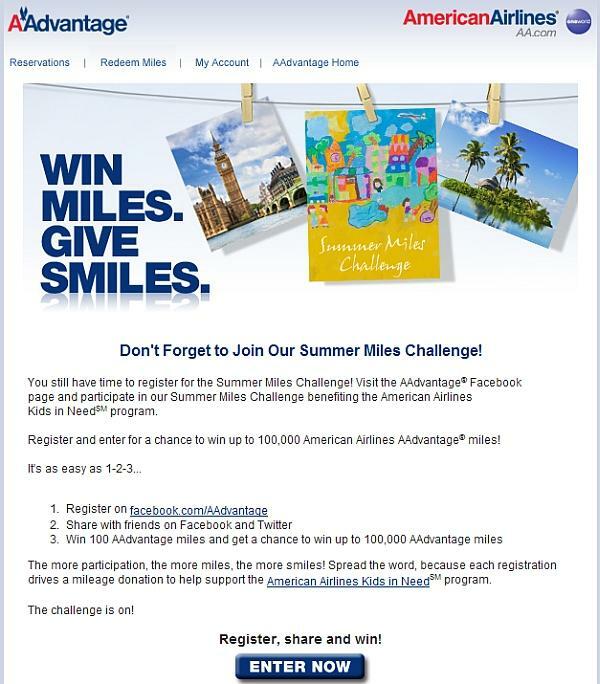 The catch here is that you need to like Summer Miles Challenge on American Airlines’ Facebook page before you can access the application to enter your account information. You can easily unfriend/unlike once you have done your part, however. After I filed the information the web page showed instantly that I would receive the 100 miles within 6 to 8 weeks after the promotion is over. I haven’t normally participated to these promos for few points here and there, but I recently had to arrange couple of hundred miles to my brother’s AAdvantage account to be able to issue an award. You never know when few hundred miles might come handy. AviancaTaca joined Star Alliance on June this year, and award tickets using LifeMiles have been bookable ever since on LifeMiles.com. You were able to find out the number of required miles by playing around with the online redemption tool. Now, however, LifeMiles has also made available a very comprehensive award chart for Star Alliance redemptions. I haven’t had time to fully digest this award chart yet, but they do most definitely have the greatest number of regions especially around the Americas that I have seen. Have you find any unusually good redemptions/combinations using the LifeMiles? Let me know by leaving a comment below or emailing me at john@loyaltylobby.com. This past spring United had a targeted promotion for bonus miles that were dependent how many round trips you were buying and flying on United Airlines between certain dates. Apparently United had been more relaxed with the ticketing dates and round trip requirement than what they had on their terms and conditions. Many FlyerTalk members reported that they had received bonus miles for flights that weren’t exactly per the terms and conditions of this promotion, and then made further plans to get the last one or two trips before the deadline to qualify for the full bonus. Quite often companies like United have restrictive terms and conditions, and what actually posts as bonus miles or points can be quite different. United has multiple times in the past foregone the ticketing date requirement from the promos and the requirement of an exact round trip to make open jaw round trips eligible as well. But this time United just withdraw all the awarded miles from Mileage Plus members. According to the release on FlyerTalk and the email received by participants of this promotion, the United will recalculate the miles earned from this promotion and will post them to qualified accounts sometime in July. It is very interesting that United has so much time on their hands to recalculate some bonus miles, when people are continuously having problems with getting correct mileage posted to their accounts for the United and partner airlines flown. It is very bad form for United to withdraw miles that were already awarded. If I had participated to this promotion and trusted United to calculate the bonus miles correctly, I would be fuming at this point. 1. Offer valid only for original recipients of email or direct mail invitation. 2. To qualify, register for the offer before travel, then purchase and complete paid qualifying roundtrips to any destination worldwide on United or United Express® operated flights. 3. Ticketing period: 04/15/12 through 07/15/12. 4. Travel period: 04/15/12 through 07/15/12, excluding 07/03/12-07/05/12. 5. On specific number of paid qualifying roundtrip flights (as outlined in the offer) members can earn 5,000 bonus award miles, 10,000 bonus award miles or up to a maximum of 25,000 bonus award miles. 6. Bonus award miles do not count toward Premier® status and do not apply to class-of-service, Premier bonus miles or promotional Premier qualifying miles (PQM). 7. Offer is not valid on United-marketed codeshare flights operated by other carriers. 8. Offer is not valid on government fares. 9. A roundtrip is defined as travel from an origin city to a destination city with return travel beginning in the destination city back to the origin city. 10. Offer is not combinable and can be earned a maximum of one time. Bonus is credited 6-8 weeks after promotion end date of 07/15/12. 11. E-Ticket® purchase required. Tickets purchased in the US through United Reservations are subject to a $25 ticketing fee, and tickets purchased at airport ticket counters are subject to a $30 ticketing fee. Fees subject to change. 12. Flight activity must be posted to the member’s MileagePlus account in order to qualify for this offer. 13. Offer is subject to change without notice. Other restrictions may apply. 14. Miles accrued, awards issued and bonus offers are subject to the rules of the United MileagePlus program. 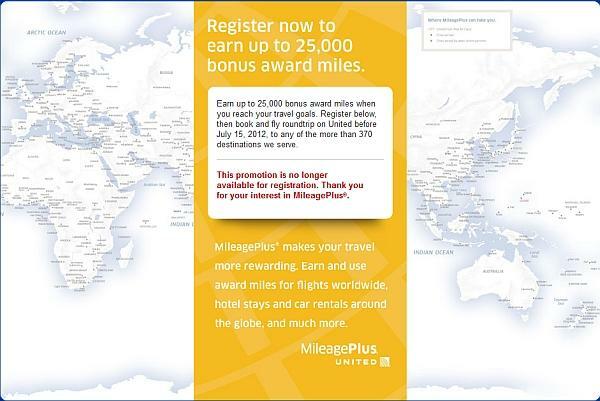 For complete details about the MileagePlus program, go to united.com. Priority Club has again changed the number of points required to redeem for Any Hotel Anywhere cards. This change came unannounced. The old redemption table gave better value for redeeming $250 card compared to lower value ones. The new point requirement for these cards is flat. You get about the same value when redeeming for $100 or $250 one. The percentage devaluation is from 6% to 18%. Any Hotel Anywhere cards are very handy at times. They are basically prepaid American Express cards that you can only use at merchants that are coded as lodging i.e. you cannot use them at grocery stores. Yes. I have tried. There is no need to use them at InterContinental Hotel Group properties, but rather they are valid at any hotel worldwide that takes American Express cards. Why would you redeem for Any Hotel Anywhere card? 1. The stay paid by Any Hotel Anywhere Amex card is considered as a regular paid stay regardless of the hotel you are using it. You can book a Hilton property and get all the benefits associated with your Hilton status plus the points as well. 2. You will get a folio that shows the amount you paid for the hotel. This comes handy if you are reimbursed for your stays by other party. You can cash out your points. 3. With InterContinental hotels the vast majority of Ambassador or Royal Ambassador benefits officially don’t apply on award stays. You may or may not get them depending of the property, however. This is entirely dependent of the hotel in question. If you pay using Any Hotel Anywhere card, you will get all the benefits of a paid stay. 4. Sometimes it is better value than using points. There are some InterContinental hotels that require 30K to 40K Priority Club points per night, yet their paid rates are sometimes low. It is actually cheaper to redeem for these cards and pay for the stay than use the points. You should always consider the number of points that you would earn from a paid stays as well. I really don’t like the sneaky way that Priority Club uses to devalue their program. They should announce devaluation like this few weeks before so that everybody could plan accordingly. The number of points that one can earn from InterContinental Hotel Group stays is quite high if you sign up for all the available promotions. In 2009, when these cards were introduced to the Australian market, Priority club ran a 50% sale on AUD denominated cards. I redeemed all the Priority Club points that I had at the time (more than a million) and received around $9K worth of these Amex cards. You could get close to 0.9 cents value out of each Priority Club point. Today the value is about one third of this. Priority Club has emailed an offer for number of Priority Club members for 100% bonus on purchased Priority Club points. You can buy maximum 50000 Priority Club points in a calendar year. During this promotion the maximum number that you can get is 100000 (50K + 100% bonus). Buy Points – Exclusive offer just for you: Get a 100% Bonus! As a special offer just for you; buy or gift points between July 10 -31, 2012 and get a 100% Bonus on your purchase. That’s DOUBLE the points! Let’s say that you buy 50K points for $575. After doubling the price of the point is $0.00575. For simplicity you are paying $57.50 for every 10000 Priority Club points. You can currently “buy” Priority Club points by doing a Points & Cash reservation for $70 per 10K points. This offer is targeted. My account was not eligible for it. You can check, whether your account is qualified by going through the following link and entering your information. The benefit of buying points through this offer rather than doing Point & cash reservations, is that they count towards the Priority Club Gold or Platinum status. Personally, I would pass this offer as I earn enough Priority Club points from my hotel stays by taking advantage of number of different promotional opportunities. Buying Priority Club points most definitely can make sense, if you can redeem them for InterContinental hotels, when they appear on the Point Breaks list. Over the years, I have used Expedia numerous times to book domestic United States and international airline tickets. I always use one of the cash back links to get some money back for these purchases, and I signed up for the Expedia Rewards program, when it was originally launched as a beta in the spring of 20122. Nowadays it is open for anyone. At the end of last year, Expedia also changed the number of points that you would earn from flight & other bookings (went down), while at the same time changing the number of points required for redemption (went up). This really didn’t concern me too greatly, because I hadn’t booked through Expedia just to get their Expedia Rewards points. It was basically just icing on the cake. At the speed I am currently earning points, I would never get enough to redeem for flight awards. Last night, when I was looking for a hotel to crash late at night for 10 hours, I decided to have a look, if I could use any of the Expedia Rewards points that I had accrued. You can redeem points for hotel coupons at a sliding scale. The $50 coupon requires 7000 points (0.7 cents per point) where $1000 coupon requires 50000 points (2 cents per point). So, I decided to issue a $50 coupon after I had found a competitively prices Expedia Special Rate hotel that I could use the coupon for. When I was paying for the hotel, I had to choose to use a coupon and use the pull down menu to locate it. Expedia Special Rate hotels are prepaid ones. As the confirmation shows, $50 was deducted from the total. I paid $19 for the night after the coupon was applied. You can also use points for airline awards. The number of points you have in your account must cover the entire cost of the ticket. One way KLM flight from Kuala Lumpur to Jakarta was price at 10700 points. You could have bought the same flight for $85. Expedia seems to value their Expedia Rewards point at $0.008,when redeemed for airline tickets. Expedia probably prefers, if you redeem for hotel coupons, because they can only be used for Expedia Special Rate hotels that are prepaid. Those are the ones that Expedia has the greatest margin. I would have preferred to see somewhat better redemption value than 0.7 cents for 7000 points. 1. You can use hotel coupon only for the base price before taxes/fees. 2. If your coupon has higher value, the difference will be forfeited. 3. If you have lots of Expedia Rewards points coming, it makes sense to try redeeming for the highest coupon at 50K points. Your Expedia Rewards point would then be valued at 2 cents instead of 0.7 cents on my experience for $50 hotel coupon. 4. You can redeem for flights only, if your point balance covers the entire cost.